I love almond butter. 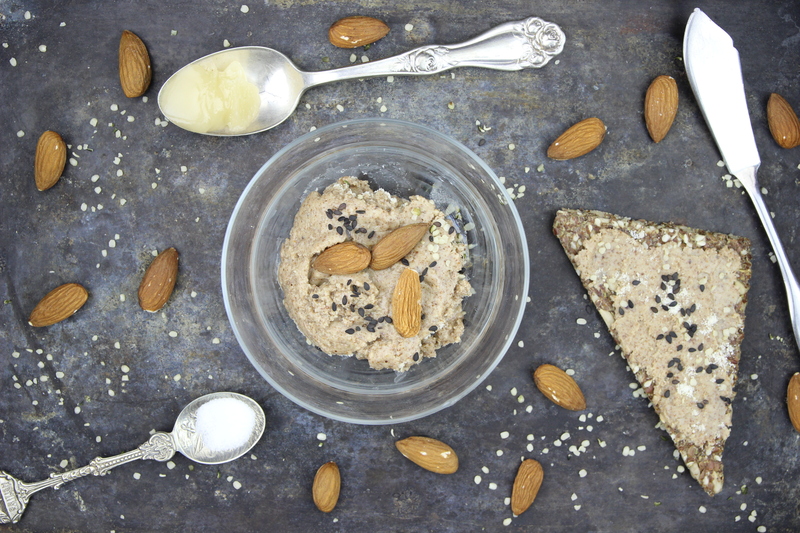 Nothing makes a better snack than raw crackers topped with scrummy almond butter. I can't eat an apple without slathering each slice in the stuff . And while store-bought is pretty good, home-made almond butter is that much better. Now you've probably heard stories about making almond butter: how long it takes, the difficulty... But it isn't that hard, truly! Really, the key factors to making excellent almond butter at home are high quality almonds, a food processor (yes, you heard right), and a little bit of extra time. You need almonds (of course! ), plus some honey and salt. That's it. And you need that food processor. So, are you ready? Then let's do it! Toss the almonds into your food processor. Start processing. Continually scrape the sides. And that's it! Process and scrape. Process and scrape. Do this for about 10 minutes (time will vary depending on strength of your food processor). The mixture will be powdery at first, but that is normal. Keep processing and scraping. It will turn into almond butter, so don't lose your patience! Oh, and on the topic of almonds: do not pre-soak your almonds. Use dry almonds or this recipe will not work! Use your food processor for this recipe! When it does reach the consistency that you like, mix in the honey and sea salt by hand. Grab a spoon and taste your butter. Isn't it divine? Making almond butter isn't difficult nor should it be traumatic. Make sure to use high-quality dry almonds for the best butter, use your food processor, and don't hurry the process. The end result is totally worth it! Where is the pdf download for Rawtarian Almond Butter? Once you go to that page, look for reddish "Download recipe as PDF" button on the left-hand side of the page, middle to lower end of the entire page.